Last year, we took a little winter trip to Delhi – just us and the other ladies in our family. We got our nails done, shopped a little and ate all the foods we miss during the year. It was so much fun and a great escape into nostalgia. There’s nothing like being able to gossip over Indian street food – the same place my grandmother used to eat at when she was at college in the 1950s. And during our trip, we got to rediscover a fabulous often overlooked Indian dessert called shahi tukda or Mughal-style bread and butter pudding. Unlike its English cousin, shahi tukda is crunchier and involves cardamom, rosewater and saffron. It’s gorgeous! So we wanted to make our own but in a different way, with chocolate, our favourite food group and with Christmas spices. 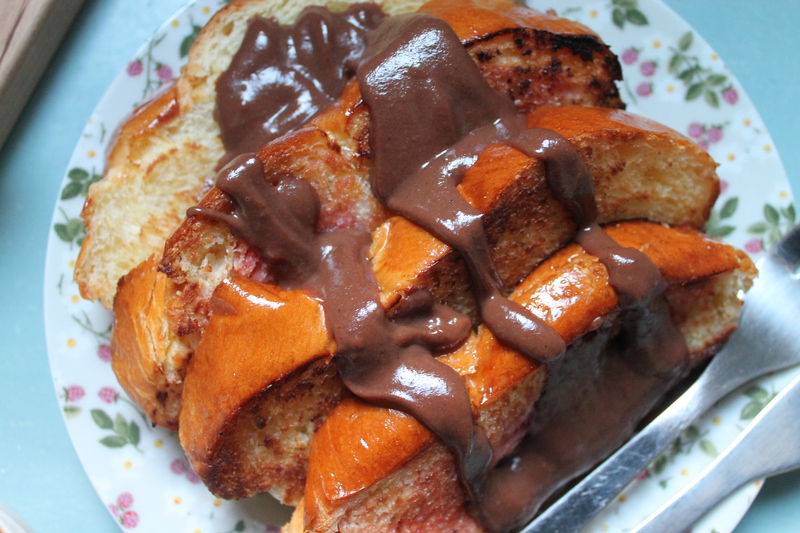 And we also decided to upgrade the usual white bread to brioche because….well, why not? 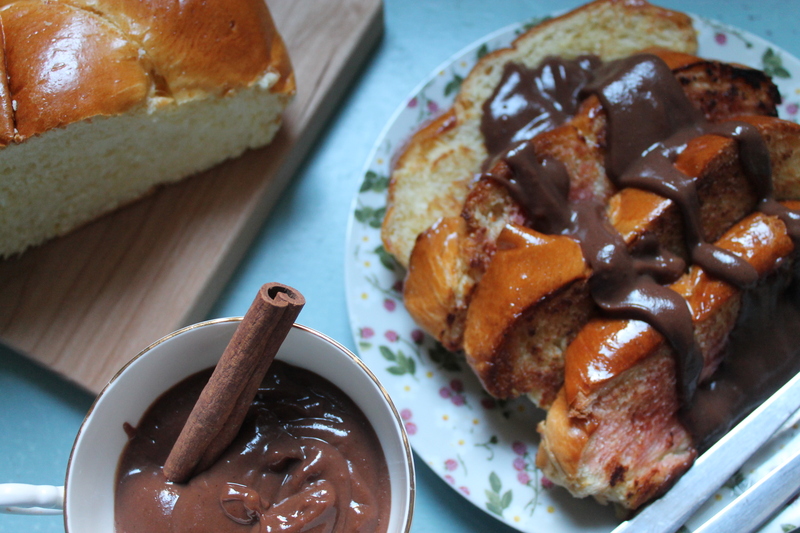 We had this for breakfast (because we’re gluttons) and it was divine! Using a frying pan, fry each slice of brioche in ghee until toasted. Set aside and brush each slice with about a tablespoon of rosewater syrup. Bring the milk to a boil in a saucepan with the vanilla pod. Take the pan off the heat immediately and set aside for the vanilla to infuse the milk and for the mixture to cool a bit. Whisk the egg yolk with the sugar in another bowl until thick and pale-coloured (this could take a few minutes if doing so by hand). Whisk in the flour and cornflour, little by little, until completely incorporated. Take out the vanilla pod from the milk and slowly pour the vanilla milk into the egg-flour mixture, whisking quickly and thoroughly as you do so. Pour the whisked mixture back into the saucepan and bring to a boil, while continuing to whisk thoroughly. Once boiled, reduce the heat so that the mixture simmers for a couple of minutes, and again continue to whisk as the mixture thickens. When the mixture is thick enough to coat the back of a spoon, take the pan off the heat and mix in the butter and cinnamon. In a bain marie, melt the chocolate gently over a low heat. Pour into the custard and stir. 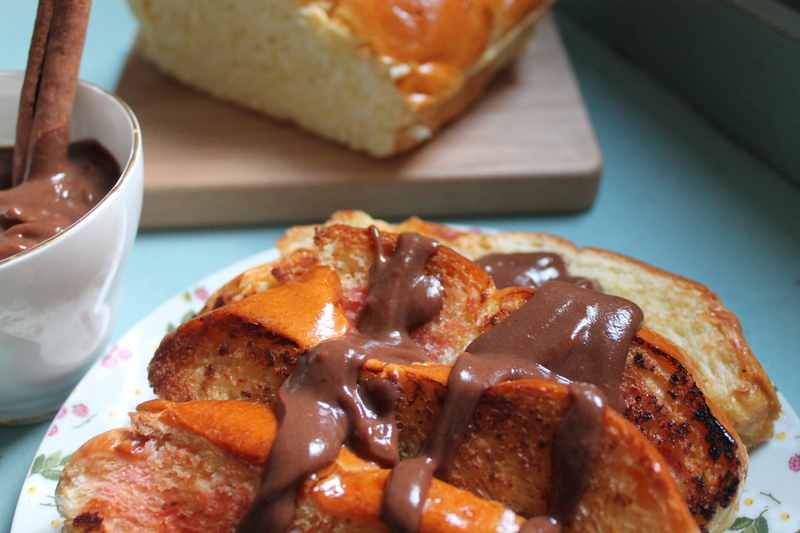 Pour the chocolate custard over the brioche slices and enjoy immediately!